Excess weight. Many people think of extra pounds as a cosmetic problem, but it is so much more than that. Obesity is as significant a health crisis in our companion animals as it is in the human population, with over 50% of dogs and cats in the overweight to obese range. Pet obesity is truly an epidemic; it leads to the same complications in our beloved animals as it does in us humans. Carrying around excess weight potentiates osteoarthritis and joint disease, hypertension, heart and respiratory disease, Type 2 Diabetes/insulin resistance (especially in our kitty cats), as well as a host of other medical issues – all of which can negatively impact a pet’s quality of life. As an athlete with a prior orthopedic injury (ACL tear repair), I am acutely aware that carrying simply 5 or more pounds over my ideal weight creates more pain and diminished athletic performance. What equates to just a 3% increase in my body weight can have profound effects on my overall well-being. By comparison, a 3% increase in weight for a 10-pound cat is a gain of only 0.3 #. For a 40-pound dog, 3% body weight gain is 1.2# or a 2.4# gain in an 80-pound dog. That doesn’t seem like much, right? Yet, it is so significant. Next, let’s think of the more common scenario: the 12-pound cat in a 10-pound frame, or the 48-pound dog, whose ideal weight is 40 pounds. Each of these pets is carrying an extra 20% of their body weight. Those additional pounds are incredibly deleterious to overall health and comfort. So, how can we help keep our pet’s weight in check? First and foremost, we must acknowledge that we, the pet parents, are in control of our pet’s waistlines. We control what they eat; we control their daily exercise. Once we accept that responsibility, then we can start making the right decisions to promote a healthy weight and lifestyle. 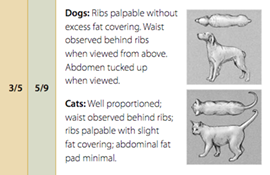 Start by assessing your pet’s current body weight. Although the scale is a good measure of weight trends, I prefer not to focus on the number. Instead, I look at how well my patients “fit in their clothes” – a visual and hands on analysis of body condition score, or BCS. In veterinary medicine, we standardize BCS on either a 5-point or 9-point scale – this provides a degree of objectivity between different professionals. I cannot fathom the challenges human physicians face when they speak to their patients about healthy weight goals. We humans tie so much of our self-worth to external appearance and take comments about our weight deeply personally. Trust me, your cat doesn’t care if your veterinarian says that she needs to lose weight. She just cares that she can’t reach around to groom herself properly. Likewise, your overweight dog isn’t going to need emotional support or reassurance – he will simply be happy that he can get up off the floor without effort and pain. If your buddy exceeds the healthy weight range or your veterinarian suggests weight loss for your pet, you, and you alone, have the ability to fix that situation. Proper nutrition and regular exercise are the foundation to achieving and maintaining a healthy weight. Nulo Pet Food makes the first part of that equation easy by offering optimal nutrition for all cat and dog life stages. The second half of the equation does require effort, but it is mutually beneficial – exercising with our pets is a win-win for our health and it gives us an opportunity to bond on another level with our 4-footed pals. When I counsel owners on weight loss plans for their pets, dietary manipulation is key. Importantly, it is not just cutting back on the amount of food. While measuring out the amount you feed and accounting for any snacks and treats is essential, what you feed your pet is pivotal. It is obvious why Nulo appeals to the athlete consumer – Nulo diets are formulated with the same dietary philosophy that the competitor strives to emulate. Athletes are profoundly aware of the importance of what we fuel our bodies with. Optimal nutrition leads to optimal performance. Our pets are performance vehicles too – if we provide them with the appropriate nutrition, it will improve their health, energy, and, ultimately, their longevity. We all want our pets to lead full, active, and complete lives. Nulo Pet Foods contain exceptional quality ingredients and are formulated with a high protein to carbohydrate ratio that delivers sustained energy, while helping build and maintain lean muscle. Additionally, the diets contain no fillers or artificial flavors – none of that junk that fails to provide any nutritional benefit. By choosing to feed our cats and dogs an optimally formulated, nutritious diet and making healthy body weight a lifetime goal, we can positively impact our pets’ quality of life, in particular their daily comfort and longevity. Nutrition as treatment? Nutrition as preventative medicine? Yes, please. Nulo Pet Food. Healthier Together.